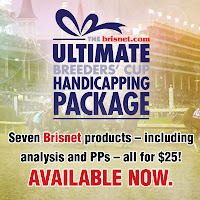 TwinSpires Blog: Introducing the Ultimate Breeders' Cup Handicapping package! 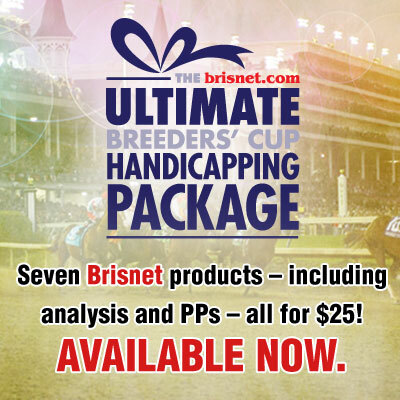 Introducing the Ultimate Breeders' Cup Handicapping package! One of the most common lamentations surrounding the build up to the Triple Crown and Breeders' Cup World Championships races is that handicappers are susceptible to information overload. When it comes to good handicapping information, I'm of the school of thought that too much is never enough, but the key word there is "good" because one piece of bad information can negate all the handicapping you've done with otherwise good information. Think of it as a recipe. Fresh ingredients make the best goulash, but one rotten tomato can really mess you up. The main ingredient to your handicapping can mess you up as much as it can help if the ingredient is bad to begin with. I'm primarily a speed figure guy, but that doen't mean I'll handicap with any set of figures any more than I'd use sour milk to bake a cake. If that were the only dairy available then I'd skip the baking altogether. And so it should go with other information such as workout reports, analysis of European imports, and past performance data to help you establish class. The people who do this on a Tuesday in February should be the same ones you trust for the Triple Crown and Breeders' Cup, and that was the thought process behind putting together the brisnet.com Ultimate Breeders' Cup Handicapping Package, which features Ultimate Past Performances, historical data applied to wagering strategies, workout analysis, European form reports, and full-card analysis for both days of racing at Churchill Downs. This is information packaged for Breeders' Cup but done by people who do this work all year, and that's the key for me. In each of the past nine years I've spent the week leading up to the Kentucky Derby and Breeders' Cup in the stable area watching horses prepare for the big races, and inevitably people ask me how certain horses looked, and I have no answer for them because I'm not an assessor of horseflesh. It's a tremendous talent that is equal parts innate and learned, and I have neither of those parts, so I leave that type of evaluation to those more experienced--people such as Jude Feld, who is doing that work for brisnet.com this year. I enjoy European racing but don't follow it nearly enough to discuss the vagaries of class among its top stars. Past performances help me gauge their speed, but their overall form requires a more attentive perspective that Alan Shuback will provide brisnet.com readers this year. This is not overload but news I can use. When dealing with a finite bankroll to bet contentious races that produce overlaid payoffs, the fine line decisions on whether to single, include, or toss a horse from certain segments of a bet make all the difference, and good information leads to better decision making. Love your stuff. Am I correct in assuming that this is an online preview? Not sure what you mean by "online preview"? There is material already available, and then we'll be adding stuff throughout the next 11 days.